Maps Marker Pro v4.0-RC4 has just been released – thanks to all beta testers for your feedback & to all translators for the translation updates! Important: if you update from 4.0-beta1, 4.0-beta2 or 4.0-beta3, please manually deactivate and activate 4.0-RC4 once after the update on the plugins page, so that the new capability system gets initiated! Afterwards use the edit link for each marker shortcode appearance and replace the marker shortcode in related content with the shortcode from the row “New shortcode”. Example: the post “Events” from the screenshot above uses the shortcode [mapsmarker marker="1"\ – this has to be replaced with [mapsmarker marker="1" basemapDefault="osm" width="640" widthUnit="px" height="480" panel="true"\ once. 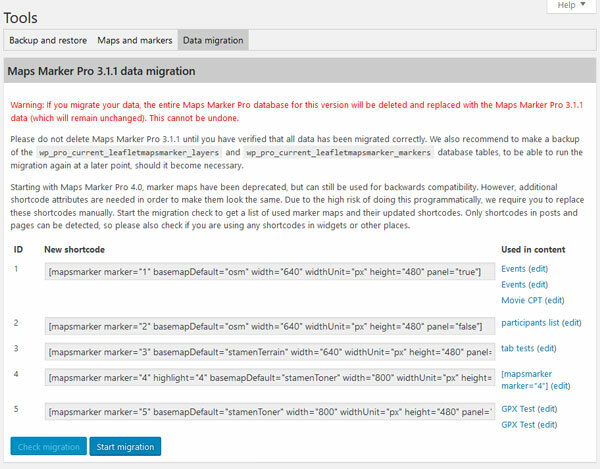 That´s it – now you can start using Maps Marker Pro v4.0-RC4. For directly downloading and installing the v4.0-RC4 package as zip file, please click here. If you want to use v3.1.1-RC1 again, please first deactivate Maps Marker Pro v4.0-RC4 and then activate Maps Marker Pro v3.1.1-RC1 again. 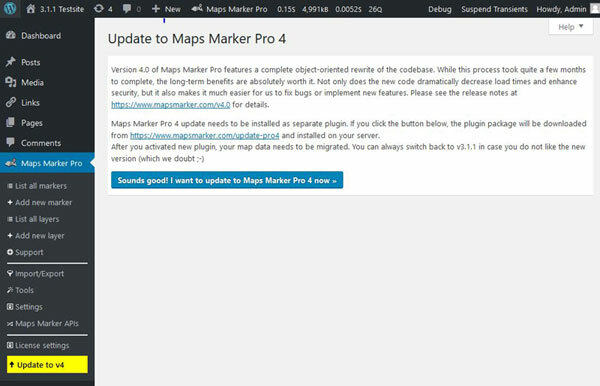 Please be aware that any maps which have been created with Maps Marker Prov 4.0-RC4 will not be visible with Maps Marker Pro v3.1.1-RC1, as a complete new database schema is used!